Back by popular demand! "An important record of a significant figure in Canadian cycling." Top 10 at Hot Docs! 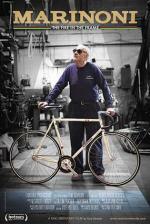 “Giuseppe Marinoni is a revered bicycle craftsman whose frames are highly admired and desired. When he’s not in his workshop, he’s likely feeding his chickens, tending his tomatoes or foraging for mushrooms. It’s clear this tailor turned cyclist is happy alone and sees no point in someone documenting his life.